BLAEU - Nova Hispania et Nova Galicia. BLAEU, W. - Nova Hispania et Nova Galicia. Nova Hispania et Nova Galicia. 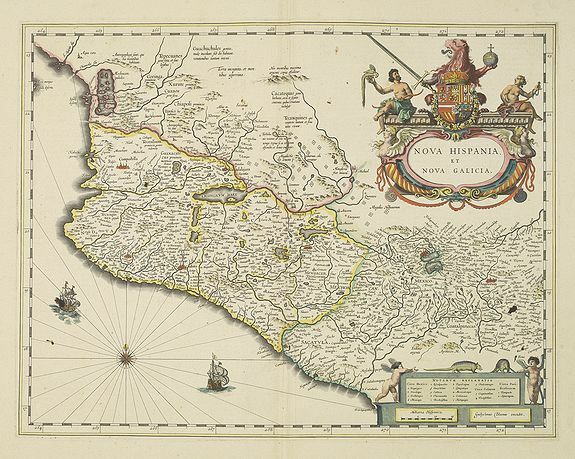 - BLAEU, W.
Title : Nova Hispania et Nova Galicia.. Size : 15.0 x 19.5 inches. / 38.0 x 49.6 cm. Description :Map of New Spain and New Galicia shows the city of Mexico situated by a large lake, as well as the location of many silver and gold mines. The map's elaborate cartouche is surmounted by the Spanish Royal coat of arms. Based on Ortelius map of 1579 which became the basis for many of the seventeenth century maps of the area. Condition : Near to mint condition. Printed on heavy paper. Very good and dark impression. French text on verso.